Water expands into bladder, air precharge on shell side. 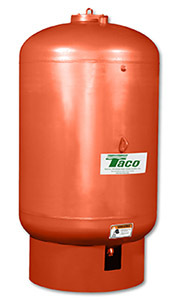 Designed and constructed to the requirement of Section VIII, Division I of the ASME Boiler and Pressure Vessel Code. All wetted surfaces of FDA approved materials for potable water applications. Manufacturer's data reports furnished upon request.